The Book With No Pictures showed kids how much fun words can be. Now B.J. Novak follows up his blockbuster bestseller with a book that gives kids even more word power, and just as much silliness. B is for "Ba baba a-baba ba." I is for "I had a big idea, I did. Feed Dad fig ice!" And by the time you get to Z, oh what a zap-zop, zippity-zoppity, zany book you'll be reading. In this alphabet book that leaves all the fun to the words, not the pictures, kids will discover that reading is as simple as building a tower of letters. As more letters are introduced, the text becomes more enticing. The more letters, the more goofy humor—and if anybody knows humor, it's B.J. 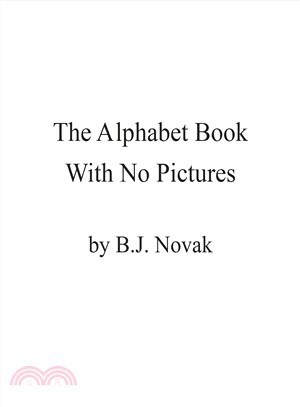 Novak, comedian and author of the instant classic The Book With No Pictures. Here he's using his message about the wonder of words in a new way that again shows kids how much power and joy there is in reading. Even better, the book pours that power right into their eager noggins. Instead of saying "Read it again! ", this time kids will be saying "Let me read it to you again!" B.J. Novak is a writer and actor best known as the author of the #1 New York Times Bestselling The Book With No Pictures and for his work on NBC's Emmy Award-winning comedy series The Office as an actor, writer, director, and executive producer. He is also known for his standup comedy performances, his roles in motion pictures such as Inglourious Basterds and Saving Mr. Banks, and his bestselling collection of short stories, One More Thing. A graduate of Harvard University, B.J. Novak lives in Los Angeles, California.